On Leech Lake, Woman Lake, Ten Mile Lake, or other area lakes, there are different kinds of waterfront properties. Let’s focus on lake bottoms and combinations of lake bottoms. The MLS lists the following types of lake bottoms: Gravel; Hard; Rocky; Sand; Excellent Sand, Soft, Undeveloped, Weeds, Reeds, and Wetland. A few examples of combinations of lake bottoms are – Soft and Weeds; Gravel and Sand; Weeds and Reeds. The photo is an example of a rocky bottom. 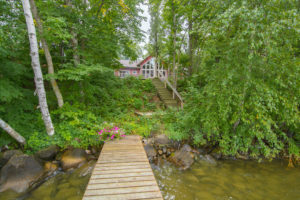 When some people are looking for a lake home or cabin, they initially indicate they want sandy lake bottom, but after they think about it, learn more about types of lake bottoms, or better understand the price differences between types of lake bottoms, they consider other types of lake bottoms, too. When people consider Leech Lake real estate or real estate on any area lake, they should consider how they want to access or use the lake; if they want to see waterfowl; and if they want to catch fish from their docks. If you want to access or use the lake only for swimming or wading, you may initially only consider a sandy bottom; however, a gravel or rocky bottom may work for you as well. Weeds and reeds are wonderful habitat for waterfowl and fish. If you like to see ducklings in the spring and watch waterfowl, weeds and reeds may be the type of lake bottom you should consider. The lake bottom at my dock is soft, weedy, and reedy. We don’t go into the water from shore; we jump off the dock when we want to cool off. Because of the lily pads and weeds, we have fabulous pan fishing right off the dock. Spring crappie fishing is extraordinary and we just have to fish from the dock. When we want to spend the day with our lawn chairs in the water, we go to a local beach…or a friend’s beach! There are many things to consider when you are purchasing real estate. Whether you are considering Leech Lake, Woman Lake, Ten Mile Lake, or another lake in the area, don’t hesitate to contact us. We are happy to answer your questions and help you. The Heather Hauser Group loves Selling the Lake Country – because it has so much to offer. Who wrote this blog? HHG member, Denise. It’s interesting that there are some waterfronts where you can just dock on the ground. I feel like it would be easiest for me to have a dock. My boat is pretty big, so a good dock would ensure that I can still use it.